Everybody, who had to do with big software projects, knows what it means to gain a survey about the project without any documentation. Doxygen is a popular open source tool, which can analyse and document software automatically. For that purpose it uses special comments in the code, which describe methods, classes, variables or other program parts. Furthermore Doxygen can visualize inheritances between classes and objects and dependances between methods. This crash course describes the installation and configuration of Doxygen and the plugin Graphviz DOT, based on a Windows system. This course doesn't discuss topics, like implementing own images or HTML syntax in Doxygen comments, in full length. But the Doxygen specific comment format will be explained in detail. Everyone, who writes programs, needs to comment his code. Typically you do this direct in the code. If you don't comment your code, you make it very difficult for other software engineers to understand your program. You even may have yourself difficulties to comprehend your own code after a time. Beside the commenting of the code, it is also often necessary to document the project. A documentation is used for presentation, makes it easy for non-programmers to get familiar with the software and is something you can hand out once the project is finished. Well, and this is the point where Doxygen is used. First of all, we need to download Doxygen (5.4 MB). And we also download Graphviz DOT. Graphviz DOT is a small plug-in for Doxygen, which allows graphical outputs, but later more about this... We should install Doxygen first, then Graphviz. Graphviz needs no configuration, but Doxygen does. Click "Expert..." in the Doxygen Wizard and select the tab "Dot". 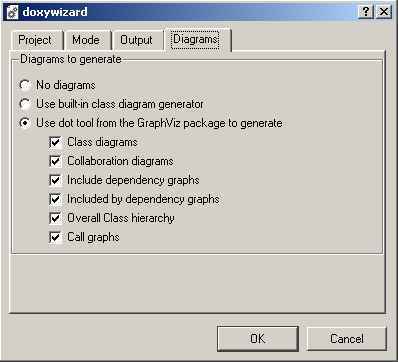 Here you need to tell Doxygen that Graphiz has been installed and the path to Graphviz. 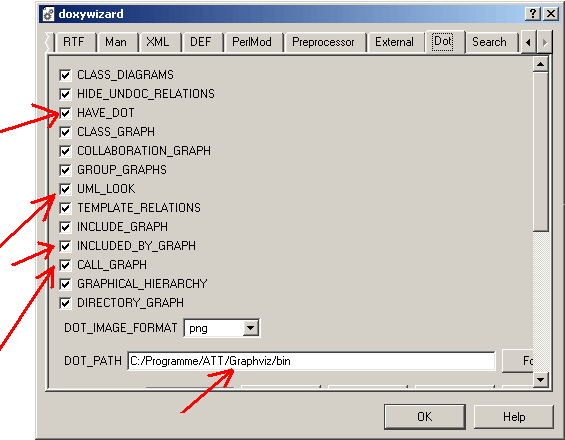 Select "HAVE_DOT" and enter the path to the Graphiz binaries. Don't use backslashes '\', but normal slashes '/' in the Graphiz path. Now confirm by pressing "OK". So, jetzt mit Klick auf "OK" die Einstellungen �bernehmen. Now back to the main window. Click "Wizard..." and you will be asked for a project name. Enter the project name and give it a version number - for instance "Version 1.0". Then specify the path to the code files at Source code directory. This Folder should also used for Destination directory - Doxygen then creates a new subfolder "html", containing the generated documentation. Now switch to the tab "Mode" and select the code language at "Select programming language to optimize the results for" (C, C++ or Java). Select the tab "Output" and deactivate the LaTex option - excepting you also like to get a documentation in the LaTex format. When everything looks fine, confirm with "OK" and once again we go back to the expert mode and select English from OUTPUT_LANGUAGE in the tab "Project". Now you should save this settings in a Doxyfile, because you certainly don't like to repeat all this steps again next time. Click "Save..." in the main window and store the Doxyfile in the project folder. Finally there is one thing left, which Doxygen wants to know: in Working directory you must enter the path, from where Doxygen starts (this is the path to the Doxygen binaries) - I found out, that you can enter any valid path (for instance C:\) here as long as Doxygen has been added to the PATH list. To check this just open a console window (Start->Execute->"cmd"), enter PATH and search the result for something like "C:\Program files\doxygen\bin". By pressing "Start" Doxygen now generates the documentation in a subfolder "html" in your project folder. This html folder then contains a "index.html". This is a Java program to sort arrays of integer with different sorting algorithms. The sorting prozess is shown graphically (screenshot). It uses selectionsort, insertionsort and Bubblesort algortihms and compares execution times. To run the program you need the Java Runtime Environment (JRE) from Sun Microsystems. Well, but function and purpose don't matter now - let's have a look at the documentation. This is the typical syntax for Doxygen comments. The double asterisk is used by Doxygen to differ from common multi-line comments. Furthermore all lines of comment should start with an asterisk. There mustn't be any spaces or other characters, before this asterisks! After the comment block follows the associated code segment. This can be a function, variable, structure, ... But important is, to leave no blank line between comment block and code segment. Keywords are identified with an @ or backslash \ to signify attributes of the code or to call special format options. A complete survey with all keywords can be found at http://www.stack.nl/~dimitri/doxygen/commands.html. Good, to illustrate this, we now go step-by-step through an easy example. Now Dxoygen would be able to document this code - but only very rudimental. Definition at line 32 of file Example.java. The text after @brief should describe the function and it purpose in a few words, while the more detailed briefing follows two lines below. By clicking More ... you will be forwarded to the detailed description. The keyword here is @file. You may wonder, if this description makes sense, but if a project grows and contains many files you'll never want to miss this documentation function any more. In priciple, all these steps are enough to generate a complete documentation - but one thing ist missing: the intro page! In the HTML documentation, the intro page is the index.html. This looks still a little bit boring by now - there is nothing more than the title and the version number. The magic word here is @mainpage and is followed by an description of the project. So far so good. But especially this intro page must look perfect - in Germany we say: the first impression is always the most formative! So finally we will deal a little bit with HTML. Note: the following keywords work only when the selected output format is HTML. With any other format, they will be ignored or may cause unwanted effects. Use <br> to force a line break. Use <b> to initiate boldface and </b> to close it. Use <i> to initaiate italic type and </i> to close it. The "../images/" means, that the image is located in a subfoler "images" in you project folder.